"The tidal marshes of the Chesapeake Bay's shallows are border habitats that connect shorelines to forests and wetlands. Just like wetlands and underwater bay grass beds, tidal marshes provide food and shelter for the vast array of fish, birds, invertebrates and other animals that dwell in shallow waters. Salt marshes are wetlands dominated by cordgrass, also called Spartina. They are one of the most productive plant communities on earth. Salt marshes are located above and below the high tide line. Low marshes are regularly flooded by the tides. The tall form of smooth cordgrass grows here. Low marshes provide critical habitat for juvenile fish, as well as shrimps, fiddler crabs, marsh crabs, marsh periwinkles and ribbed mussels. High marshes are irregularly flooded by strong winds or exceptionally high tides. Three-squares, saltmeadow cordgrass and the short form of smooth cordgrass grow here." I've always referred to it as marsh grass. Spartina? Really? Recently I drove down to Bethel Beach late in the afternoon. Normally when I drive somewhere specifically to take pictures, it's in the morning. Very rarely do I come down to these beaches so late in the day, which may be why I don't remember ever seeing the sky here this blue. If you're here in the morning, sunlight is taking up most of this empty blue space. With the sun behind you, a whole new world opens up. Throughout this week as time permits I'll share more photos from this little journey. For now I must return to working on the book and tackling the dirty clothes pile known as Mt. Laundrest, which has grown so large it's blocking out all daylight in the 23076 zip code. I sincerely hope your day is relaxing and laundry-free. If it's Thursday--and I believe 'tis--that means it's time for me to share three things and you to share three things. These three things can be related, unrelated, random, purposeful, ridiculous, marvelous, insane inane or mundane. Whatever you want. 1. The time is drawing nigh when I will be cutting back on the frequency of blog postings to focus my attention on the book. 2. What kind of person in this day and age--in this century--says something is "drawing nigh?" 2b. Probably the same person who suggests to someone at the paying job that they should put the sandwiches in the icebox before they spoil. 2c. When CBW That Person caught herself saying icebox instead of fridge, she said, "Oh, sorry, I just call it that because that's what my grandmother always called it." 2d. Then the Twenty Something laughed and said, "Oh, Chesapeake Bay Woman, you're showing your age." 3. When Chesapeake Bay Woman reflected upon her age in relation to the others she works with, she wondered if she ought not put herself in the icebox before she spoils any further. Now it's your turn to please share three things, whatever happens to be floating through your mind at the moment. If it's nigh on impossible to keep it to three things, feel free to share more. This is a shameless reposting of a story written in 2009 by my mother about Gustav's friend Ralph, who left this life for Goose Hell Heaven several years ago. Enjoy. Sometimes well-meaning people give little children Easter gifts of baby animals, instead of candy likenesses, which are more practical. Usually the baby ducks, geese, rabbits, etc., grow to become problems with feathers or fur. I fell heir to some ducks and geese who failed to fit in well with the first owners; my thought was that I could manage to give them a pretty good life and, for the most part, that was the case. Everyone settled in: fences were erected, plastic pools were provided* and those who got along stayed together. As every poultry person will attest, male birds just don't know how to get along with anything but an ear of corn; something to draw parallels from in that. Therefore, the two male geese were separated from each other and all else. Occasionally the largest goose, already named "Ralph" by his former owners,was allowed the run of our 4-acre yard. Ralph was pure white and truly enormous and when his wings were spread they looked like those of an angel pictured in my Bible story book. The comparison ends there, however, though he was the most people friendly goose I have ever known. We never weighed him, but 25 pounds would not surprise me. Although affectionate, a goose is a goose, is a goose; and a goose by any other name will still pinch hard enough to stop your heart! He had his uses and we were always grateful when he prevented the well-meaning but always intrusive Jehovah's Witnesses from paying a call. They took one look at Ralph, wings spread, coming at them with head in battle station mode and drove on. Each of us has his own special Ralph story, including the grandchildren who learned to run very fast with Ralph as a personal trainer. Granddaughter owes her basketball defensive prowess to her constant "one-on-ones" with Ralph, offense being his only game. He gave new meaning to the term "pick and roll." I think he liked me best, but I too wore the scars of his somewhat indecisive devotion. Bending over to fill his food container one day, he struck like lightening at the bull's eye of my most private place. ** Illegal, immoral and unconstitutional, it taught me never to turn my back on anyone with my bottom in the air--altogether a good policy. Whenever there were bruises--and there were some--we got huffy for a while, but always came around when he endeared himself by announcing the arrival of anyone who dared to set foot on our property. As everyone assured us, we would never be victims of a sneak attack by anyone but Ralph. True and true. * The water fowl section of my mother's nature preserve includes several plastic swimming pools made for small children but used recreationally by geese and ducks (when they were still alive) even though there is the entire Queens Creek right in our back yard; and an enclosure made of chicken wire inside a wooden fence (two layers of entrapment). At one point there was also a nylon tent, which is where the ducks slept all nice and incarcerated zipped up "for their own protection" each night. Lucky ducks. ** This happened to me once when I was in my own yard (where Ralph seldom ventured) minding my own business, bending over to reach a french fry from off the floor of my car. As soon as my hands touched that french fry, he zapped me right where it counted. Mypsyche vocal chords suffered permanent damage from the ensuing scream, and I'm not sure which one of us was hissin' and spittin' the most. I do know I've had an aversion for cleaning out my car ever since, and I recoil at the sight of a dried up french fry. It could be argued successfully that I never cleaned out my car anyway, but this is neither here nor there. On the same property where the old Gwynn's Island School once stood is a building that used to be Shiloh United Methodist Church. Shiloh was founded in 1893, and services were held in this building in its previous location across the street until 1976, when the congregation merged with Mathews Chapel in Cobbs Creek. The building is now used by the Gwynn's Island Civic League. The Gwynn's Island Civic League building used to be a church named Shiloh. Shiloh United Methodist Church was moved from its original location directly across the street. The site on which it now sits used to be the Gwynn's Island School. The Gwynn's Island School was moved across the way to house what is now the Gwynn's Island Museum. 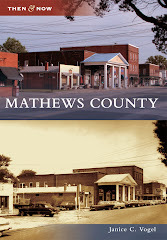 No matter which building or patch of land you pick out in Mathews County, rest assured it has lived a thousand several lives. The Gwynn's Island Festival is held on this site each year. Last year Chesapeake Bay Woman wore a crab hat to the festival. She was shocked to realize she was not the only one. A lady at one of the food booths wore one too. This year's festival will be Saturday, June 25. Chesapeake Bay Woman thinks it would be a grand idea to sell crab hats, since last year so many people asked where she purchased hers. Anyone wishing to reserve booth space at the Gwynn's Island Festival should contact Cricket Call at (804) 725- 7577. My mother and I played softball against Cricket back in the late 1970s/early 1980s. Oh, how I loved the summer softball leagues back then. I'll stop now before I venture too far off track. This concludes a post which had its roots in Shiloh but quickly sprouted out to crabs hats, the Gwynn's Island Festival, and Parks and Rec softball. This workboat lives on Edwards Creek over on Gwynn's Island. "Whether it's a deadrise or skipjack, a pungy or a bugeye, classic Chesapeake workboats are anchored in tradition. Early log-built canoes, sleek schooners and versatile sailing skiffs all inspired builders to craft variations that matched hull shapes, sailing rigs and other features to the promise and perils of working the Chesapeake Bay." "From the beginning, mariners needed maneuverable, shallow-draft vessels suited to the narrow inlets and shoal waters of the Bay and its tributaries. In the 1800's, exploding demand for Chesapeake oysters drove the evolution of larger, faster boats that could work far from shore in all kinds of weather. New technology supported many changes: sawmills cut lumber for boatbuilders, refrigeration and canning methods improved, and roads and rail lines promised ready access to distant markets. And while small operations continued with traditional gear - hand tongs, dip nets and hand seines - with time, increasingly efficient scrapes, dredges and fishing apparatus became available to help watermen maximize their catches." Before too long these beautiful boats will be museum pieces. This one's very much alive; and she's for sale, according to that little sign there to the left of the window. If money were no object, she'd be sitting at the end of my dock, and I'd be happy as a clam just sitting in the cabin breathing in the smells of the wood. p.s. Unrelated to any of this, my friend Meg from Soup is Not a Finger Food, was enjoying time away from home with her family this weekend when she learned that a fire--made worse by Saturday's winds--had taken over her neighborhood, her yard and her home. Click here to read her incredible story, and feel free to leave words of encouragement, which I'm sure she can use right about now. Today's photos are from the road leading up to Bethel Beach. Sign warning you about the bridge at Bethel Beach. It's a good thing this sign is here. With so much traffic and congestion to navigate through, some sort of advance warning is always helpful. Actually, aside from the occasional fisherman, the only thing causing congestion on these roads are fiddler crabs in the summer time. They need to put a sign up for that. Warning: Creepy Little Crustaceans Crossing With an Attitude Their Oversized Claws Held High in the Air. The bridge. At Bethel Beach. Don't blink; you might miss the bridge. Actually, you can be staring straight at it like now and still not see it. The view again from the bridge. Even though it's a narrow little one lane bridge, complete with warning signs and all, it's possible to stop your car at the top, roll your window down, leisurely take some photos, do a crossword puzzle, ponder the meaning of life and wonder what's for dinner without ever encountering another vehicle. Nobody goes down here in the winter. Except people like CBW who are avoiding their life To Do List. The shots above are a bit out of order. The first one was taken on the ride in towards Bethel Beach. The rest were taken as I was leaving, so the sequence of events is a bit off, but being just a bit off is normal for me. This concludes our Sunday drive over the little bridge approaching Bethel Beach. Try to contain your excitement. Thanks and have a great Sunday. p.s. A quick count shows that I said Bethel Beach at least six times in today's relatively brief post. Seven if you include the label below. Eight if you include this p.s. It's time to stop before this gets any further out of hand. Although it's a much anticipated long weekend here in the Chesapeake Bay household, with no school or work on Monday, we are as busy as ever. Since there's no time to think or even breathe write, I'll just leave you with more photos of Gwynn's Island jetties, taken several weekends ago in frigid weather. The temperatures here yesterday were in the seventies. Daffodils are sprouting. Birds were singing. I was able to open the sliding glass doors and let fresh air inside. Most importantly, my bare feet touched the Earth for the first time in ages. Shoes and Chesapeake Bay Woman do not get along at all, and if she were Queen of the World going barefoot everywhere, weather permitting, would be perfectly acceptable. On such occasions when going barefoot might prove impractical, the official national shoes--flip flops--could be worn. Also, she'd declare a mandatory 12 weeks of annual vacation for all workers. But she must stop now before she cannot reign herself back in to the blog post that was already in progress having nothing to do with CBW being Queen of the World. In short, yesterday I felt like a human being for the first time in months was heavenly. May your weekend be as refreshing and rejuvenating as yesterday's fresh air and warm beams of sunshine were here. Last week I received a lovely e-mail from a reader by the name of Hannah who lives elsewhere but owns property in Mathews. She very graciously granted me permission to trespass visit her dock and take some photos. Her dock is one you could perch on and sit, mesmerized, for a long time, staring off into the distance, as you slowly unwind and decompress. I have a friend who routinely says decompose instead of decompress. Although I always laugh at the mix-up, here recently I've come to realize that in order to truly relax you do indeed have to rot and become one with the Earth break down and break apart those things that are stressing you and let them melt away, release them. Sitting at the end of a dock is a great way to decompose and decompress. Yesterday I remembered I hadn't picked up the mail for two weeks picked a winner for the Dr. Wayne Dyer DVD referenced in Monday's post. So I wrote the names of Monday's commenters and dropped them in my favorite mesh John Deere baseball cap, which I wear during grass-cutting season. Grass Cutting Season runs roughly from March 1 through November 30 here in Mathews, concurrent with Insect Season. The very same Hannah who let me visit her property! Thank you and congratulations, Hannah! E-mail me your address and the DVD will be in the mail as soon as I can get to the post office. (At the rate I've been averaging, you can expect the DVD by Christmas.) You will definitely appreciate the message and spirit of the film. Here's to a relaxing weekend full of moments of decomposition decompression. When was the last time you sat on the end of a dock and just listened? Welcome to Three Thing Thursday, where I share three things and you share three things, related to whatever topic happens to spring to mind. I'll start but hope to be brief since I'm half dead a tad winded from all the goings on the past several days. 1. On Tuesday, Chesapeake Bay Son was granted legal permission by the state of Virginia to drive--as long as someone in the passenger seat has a valid driver's license. That means he can drive over the bridge which spans the Rappahannock River, which is about four thousand miles long and about ten Mt. Everests high with pipe cleaner for a guard rail the last time I checked. He made out just fine. Evidently. 2. Chesapeake Bay Daughter, who is all of 12 years old, is asking permission to attend a party tonight. Last time I checked, tonight is Thursday. When I was 12 the only parties I attended on any night much less a Thursday night were these: I seriously cannot believe they just push you out the hospital in a wheelchair and wave happily goodbye when you give birth. They must cackle like hens as the parents drive away with the newborn, knowing full well that when the baby turns 12 they're going to be talking about parties on a Thursday night, when the parent is so worn down from a demanding job; a book deadline; an older brother who is driving; and other assorted traumas that the overwhelmed mother doesn't know if she's coming or going. CB Daughter doesn't have school tomorrow, and the party is fine, it's just that One Last Thing at the end of a very long day; that one straw that breaks this a mother's back. 3. Yesterday, just like the other days this week, I awoke at 5:15, drove 50+ miles to work; worked; drove 50+ miles to a basketball tournament; screamed for at least an hour; felt as though I'd played a basketball game instead of watched one; and came home very late at night to finally write this blog post. Well, OK, Tuesday night you can substitute a spring sports meeting for a basketball game and sighing instead of screaming. Still. 3b. Baby Sister traveled from Richmond to watch Chesapeake Bay Daughter's final basketball game last night. Although we lost the game, it was close. It was good seeing Baby Sis, even if she did call me a Fish-Eyed Fool. Just so you know, Chesapeake Bay Daughter reminds me of Baby Sister, who scored over a thousand points in her high school basketball career and has her own basketball in the trophy case at Mathews High School to prove it. 4. As long as I'm bragging, Chesapeake Bay Mother confirmed after the game last night that she was the first female ever to earn a four-year varsity letter in basketball at Gloucester High School back in the 1950s. Please share three (or more) things on any topic whatsoever. Thank you for reading and thank you for commenting. Garden Creek Road, February 2011. BTW, this has nothing to do with today's blog post. Anonymous Mathews Native played high school basketball with my Baby Sister, and she and I attended the same college. She's full of talent, and does a good job here of providing a glimpse at what life is really like around here. Without any further ado, here's her story which I originally posted in December 2008. Thank you, AMN! Young readers, let this be a cautionary tale – never tell anyone that you enjoy gift-wrapping, you will be cursed with doing all the gift-wrapping for your family FOREVER. I have wrapped everything you can imagine -- from a single 4 mm pearl to an ironing board. My mother hands me my own gifts already boxed, so I can wrap them for myself. I no longer do fancy bows or ingenious tags -- the thrill is gone. When I was in college she saved all the wrapping for me when I got home for winter break. I usually accomplished most of it in the middle of the night when everyone else was asleep -- and it’s there that our tale really begins. I was jolted out of this zombie-state by the surprising vision of headlights rounding the driveway, and I headed to the back door to see who it could be. No, no, it wasn’t Santa Claus -- if it had been any time before midnight, I would have stopped to put the coffee pot on, because it surely would have been my uncle, but this was even too late for him. I was met on the back step by a Mathews County deputy (who shall remain nameless to protect the guilty), who calmly informed me that our entire herd of cattle (about a dozen cows) was outside the fence and wandering on the highway. This was really bad. I had visions of horrible cow/car pileups and ensuing lawsuits. I told the deputy that I would awaken my parents and that we’d be out the lane in a few minutes to gather the herd. I roused the ‘rents and threw on some warm layers, because it was about 17 degrees out, and trotted on foot out the lane. I paused long enough to collect a “cudgel,” in case any of my bovine friends needed to be either persuaded (to come home) or dissuaded (from trampling me) and I was accompanied by my cheerful, loyal, loving, yet-not-too-bright dog. I set off down the lane, and found the oh-so-helpful (hear the dripping sarcasm?) deputy watching from his (warm) car across the highway, shining his headlights on the herd. The cattle were now between the highway ditch (remember this is Mathews – the ditches are six feet deep) and the pasture fence. There seemed to be no imminent danger of them getting back into the road. I had no idea how they had gotten out, so my plan was to drive them along the fence/ditch corridor. Once I had them in motion, I’d climb back through the ditch to the highway, circle wide enough and fast enough to meet them at the lane, and encourage them to turn into the lane (instead of the highway) without spooking them. Once I got them back into the yard, I could put them into another enclosure until we could inspect the fences and gates in daylight and see where they had escaped. The plan was a good one, except for one oversight which shall soon be revealed…. I trotted down the highway, and climbed (with some trepidation) through the dark ditch and began slowly to herd the cows along the ditch/fence corridor (and away from the church and graveyard on the corner – Yikes, cows in the graveyard! now that could have been very bad!). At this point, the “helpful” public servant DROVE AWAY--and left me alone—with twelve cows—in the dark—at 3 AM on Christmas Eve’s Eve! I couldn’t believe it! And still no sign of Mama (mumma) and Daddy! I turned my attention back to the cows, who had gained sufficient momentum to make it to the lane. I was about to cease encouraging them from behind and to slip around to the side to perform the tricky one-woman-herd-turning-maneuver. (Ideally it should have taken about three people to do this easily – one “encourager” in the rear, one in front to stop their forward progress, and one to dissuade them from turning left onto the highway, leaving a right turn down the lane as their only option.) Just as I was preparing to cross the deep, dark ditch once more, my not-too-bright “oversight” kicked into high gear. The sight of several cattle moving in the same direction was just too much temptation for my mixed-breed, sheep-doggy, “Benjy-on-steroids” hound to resist! He suddenly started barking and nipping at their heels and driving them with such ferocity that I saw at least two dark shapes keel over belly-up into the ditch in the confusion.The rest of the cows high-tailed it for the courthouse! They were almost to Linda’s Diner before I could get them turned around. I caught the dog by the collar and performed the rest of my herding maneuvers while dragging him along by the neck. * My lungs were burning from my belly-button to my earlobes. The mad dash in the cold night air catching the courthouse-bound cows almost KILLED me.However, SHEER RAGE at the dratted dog and the disappearing deputy spurred me on and I caught those cows and turned them around. With gritted teeth, dragging the dog behind me, I managed to get them headed down the lane and into the yard. Just as I chased the last cow into the yard, one parental unit careened around the house in her large sedan. The other cruised up from the barn in his pickup truck. Steamy, warm air billowed out of their vehicles when they rolled down their respective windows. I swear I could smell hairspray on my mother, and minty-fresh breath on both of them. I mean come on, people! This was an emergency! No time for teeth-brushing and hair-combing! Where are your priorities? My dad got a good chuckle out of the dratted dog and the courthouse-bound cows. At the time, I did not think it was funny. *No actual dogs were harmed in this process -- he was just as happy and goofy as ever afterwards. Nothing fazed that dog -- one of his most endearing traits. The cows, even the ones who fell in the ditch, were equally unharmed. I, however, had a vicious cough for the rest of winter break (and a serious grudge against that deputy to this very day). Anonymous Mathews Native is correct in that the ditches in Mathews County rival the Grand Canyon, and you surely do not want to end up in one, especially if you are a cow recently sprung from prison heading to the courthouse and/or Linda's Diner being chased by a not-so-bright dog. Also? The image of that steamy, warm air billowing out along with their minty-fresh breath just cracks me right up. Bravo! From Old Garden Creek Road, February 2011. Again, no connection to today's post. Just sharing photos. Last Thursday when we had that dusting of snow, I drove down to Bethel Beach and then made a pit stop here at the public landing at Onemo. Heck, I'd driven that far, I may as well stop in here and make sure everything's OK.
For the record, everything was OK. This was a weird sort of snowfall. It stuck to the dock, for example, but not to the road. It was on the sand at Bethel, but not on the grass. It was right about this time, as I was getting comfortable on the snow-covered dock, taking in all the sights and marveling at the quiet, that I felt those eyes on me. Those eyes. The beady ones you can't really see well in this photo. But trust me, they're there. And they're piercing. Then, as I said in Saturday's post, I quickly left due to the bitter, brutal cold. In delightful contrast to those frigid temperatures and light dusting of snow, yesterday's thermometer reached 70 exquisitely warm and perfect degrees. At work I went for a 45-minute walk during lunch and luxuriated in every precious breath of warm air and sunshine. Later in the day I reveled in the breeze made when my daughter swished a hook shot in the first game of her basketball tournament. I'm not just saying this because I'm her mother, but Chesapeake Bay Daughter needs to join the Harlem Globetrotters. OK! Granted, maybe that is something only a bragging mother would say. But I still stand by my statement. This 12-year-old daughter of mine can play some basketball, and she has moves you cannot teach. It gives me chills, even on a 70-degree day inside a gym that's so hot and sweaty you want to dive headfirst into an ice bucket and then wallow in talcum powder. Do they even make talcum powder anymore? Is anyone still reading? Today I brace myself for a tsunami of emotions a new climate known in the weather books as Clear Air Turbulence, or turbulence that may occur in perfectly clear air without any visual in warning in the form of clouds. In other words, today Chesapeake Son gets his Learner's Permit when just yesterday he was a baby who nearly choked on talcum powder, which is a story for another day. Or, in the words of my favorite grandmother, uttered slowly and with emphasis on all the nouns, "Lawd have mercy on my soul and body." Assuming my math is correct, today marks the 1,000th post for this blog. March of this year will mark my third year of blogging. Combine all this with Valentine's Day the fact that I heard a songbird yesterday, and there's good reason to celebrate with a little giveaway. The post that received the most comments was 2009's Name That Goose with 48 comments. (Even when you subtract the two I made it still is the clear winner). This was how my mother's killer goose received his official name of Gustav. That goose now has his own Facebook page, his own video and is an international nuisance personality. Click on the link to read the other names people suggested and to see a picture of him and his attitude aboard a John Deere tractor. The second runner up for highest number of comments was Name That Ghost, which was a contest to name a ghost haunting a house Mathews Mark lived in. One of the most viewed/downloaded photos is the one above, which I took back in 2008 on a camping trip on the Eastern Shore. One of the most viewed posts is one I did on Merthiolate and Mercurochrome. In summary, it appears that when I write about anything except Mathews, it's a hit! Very few things have given me as much pleasure and enjoyment as writing this blog, even though most days I wonder why I do it, who on Earth would ever care about reading it, and why I continue to spend so much time on it. I have about 65 followers and receive about 100 hits per day, give or take. These are low stats compared to real/professional bloggers, but to me they are astonishing! I cherish each and every visit, and each and every visitor, even if people are usually just stopping by to find out why Mercurochrome was banned in the U.S. or to see if they can find a good name for a ghost goose. Within one year of starting this blog, I had enough bloggers interested in Mathews that they wanted to come for a visit, and the first of two Blog Fests was born. This year, the core group--and others--will participate in Blog Fest West in Seattle. Within two years, a publisher stumbled upon the blog and mistakenly thought I could write a book signed me on to do a pictorial history of Mathews. This blog has opened up doors that I never knew existed. I've met so many wonderful people, made lifelong friends, reconnected with people from my past, and received so much joy from letters I receive from random readers. Although it is time consuming, blogging has truly been very, very rewarding. To say thank you for reading, I'm re-gifting something I won a while ago in a contest held by friend and fellow blogger Mental P. Mama: The Shift, a DVD starring Dr. Wayne Dyer. Although she sent me this DVD a long time ago, it wasn't until last Friday night that I got around to watching it. I absolutely loved it. Dr. Dyer talks about shifting from a life that focuses primarily on achievement and accumulation vs. serving and giving back; about creating a life of meaning and purpose. Most of all he talks about the importance of art, creativity and connecting with Nature, something I've been able to accomplish by moving back to Mathews in 2001 and sharing the photos of this beautiful area on the blog. To enter for a chance to win, just leave a comment. I'll announce the winner later in the week after I survive a basketball tournament, the work week, and a son who is studying for his learner's permit. When did I grow old enough to have a son who is soon going to be driving an automobile?! Serenity now. Thank you, thank you, thank you for reading and bringing me so much joy with your kind words and hilarious remarks. Oh, and Happy Valentine's Day. Yesterday I drove down to Peary to take some photos from property a reader gave me permission to visit. I'll share those photos later in the week. Afterwards, I decided to drive down to the old Peary post office. On the way, I was stunned to see this church, St. Matthew. It sits on a corner at a bend in the road. I didn't remember it was here since I very rarely get this far down Potato Neck Road. Yes, it's called Potato Neck Road. And if you've never heard of Peary, that's because the Peary post office shut down many years ago. However, to us locals it's still Peary. This road sign near the post office provides some supporting evidence. I'd say she's doing OK; at least she's not acting her age like so many other buildings around here. In closing, and unrelated to the Peary area of the county, if all goes well I hope to have a special announcement tomorrow that may involve a give away, the good Lord willing and the creek don't rise. The other day I was down Onemo taking some photos from the public landing. All of a sudden I got that feeling, the one you get when you just know someone's watching your every move. I froze in my tracks and slowly, cautiously glanced around. And there he was: a Chesapeake Bay Flamingo great blue heron. He was hunkered down trying to stay warm. Although they usually don't like their territory invaded, this heron didn't fly away. I, on the other hand, soon did. It was freezing cold and my unprotected fingers couldn't take it any more. They say we can expect some warmer temperatures this weekend. I sure hope they know what they're talking about. I'm blaming the cold weather for everything that is wrong these days, up to and including my wanton use of obscure words like "hunker." It's not right, I tell you. Have a great Saturday. Is anyone doing anything interesting? Thursday we awoke to a light dusting of snow and very cold temperatures. In lieu of glancing at facing my overflowing To Do list, I opted to take a drive down to Bethel Beach. If a person could achieve a Ph.D. in Procrastination, I'd be the highest ranking scholar and subject matter expert on the topic. The beach was beautiful, as always. It's so quiet and desolate there, a great place to escape from reality clear one's head and focus on what's important. There was one very important thing I focused on here. No matter how hard I tried, I couldn't help noticing how closely the lightly dusted beach resembled an iced oatmeal cookie. Click here if you don't believe me. If you have any tips for coping with the dreaded disability known as procrastination, let me know. Otherwise, pass the oatmeal cookies-- iced, please. Welcome to Three Thing Thursday where I share three things and you hopefully do the same. 1. The photo above of a gorgeous piece of driftwood was taken at Haven Beach a week ago. I love how the roots of this tree seem to be embracing each other in one last stance against the world and its elements. 2. Without the context provided in the un-zoomed photo below, you might think the shot above was of the tree's branches rather than its roots. I love that it isn't and that the roots cling so tightly together. 3. One thing I don't love is my use of made-up words like un-zoomed or de-zoomed how many days stand between me and the remote possibility of a vacation (defined as a break, not even as a getting away) of any sort. Until I complete quite a bit of work, there is no end in sight. I'm the sort of person who really needs a one-way ticket to Bora Bora something other than work to look forward to. Now it's your turn to share three things. If you can't think of anything, please tell me something that you're looking forward to, be it a dinner date; a treat for yourself; a night out with friends or a one-way ticket to Bora Bora vacation.